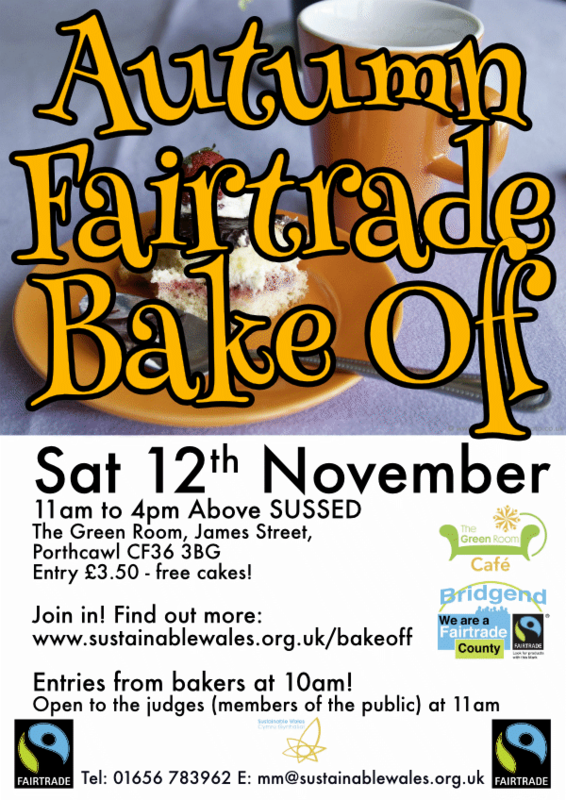 Fairtrade Bake Off held in Porthcawl, hosted by Sustainable Wales. This is a fantastic opportunity for you, your school, church or group to get involved. (Prizes for best under 15 and best over 15 will include SUSSED Gift Vouchers). Bake some Fairtrade goodies bring them, with recipe, along on the Saturday, 10am. You need to register by calling 01656 783962 or emailing mm@sustainablewales.org.uk by Friday, 12th November. On the day, simply bring your favourite recipe along with your cake made with as many Fairtrade ingredients as you are able (many ingredients available in SUSSED). Recipes and pics will be published on the Sustainable Wales website and facebook/twitter. Entry for cake bakers is absolutely free! What about if I just want to come and enjoy the cakes on offer? From 11.00am - 4pm The Green Room Café will be open and members of the public will be invited to join in the tasting and helping to judge! Tickets are £3.50 and include coffee/tea and lots of tastes. What a bargain! Download the poster and help support this fundraising event. Any profits will go to charity Sustainable Wales.